So regardless of where you go these days, your favorite cafe for a latte or you’re on a vacation on a tropical isle, we all have become accustomed to having readily available access to the Internet. It also makes us often forget how extremely vulnerable and exposed we are to online wireless security threats. Say you’re on your way on a cross country road trip, you’ve planned on traveling through several cities along your route. So although you’re fully aware that you using any online device, that you’re always open to potential security attacks or someone possibly hacking into your mobile device. You may also be thinking, heck, none of this will never happened to me, I’m safe. Keep in mind that there’s always a first time. You get back from your trip and you find that one of your social media sites has alerted you regarding some suspicious unidentified activity on your account from an unknown IP address. You realize that you’ve been violated! What most likely happened is that someone somewhere along your vacation path was able to crack your password and then logged into your social media account, most likely using a Firefox extension known as Firesheep. What Firesheep does is it’s able to intercept your un-encrypted cookies from Websites which are on an unsecured WiFi network while it’s open. It makes it possible for this program to be able to steal any login information for these social media sites that you may have accessed. It can even potentially access your email accounts. So again, nope, it will never happen to you, right? Well, wrong. Fortunately, if you use a combination of some solid common sense as well as some advanced up-to-date security technology, you’re able to protect all of your mobile devices effectively. Make sure that all of your software applications are always up to date. Before you take your trip, or once every few weeks for that matter, make sure that you check with the software’s site to see whether there are any updates or patches available. If there is one, then download it and install it, unless of course you see negative reviews from those who are using it, as in too many bugs. Use an unrelated combination of letters as well as numbers and special keyboard characters. Make sure you always use 8 or more characters. Avoid using any words from the dictionary or your birthday or your dogs name. Instead, use acronyms for easy to remember things such as your favorite song or restaurant and write it down. Then looking at that name should trigger what your password is. Also make sure that you change the password as frequently as possible. Most recommend every six months or so. If you don’t want to come up with your own strong password, there are programs such as RoboForm, which will make one for you. The majority of the settings on the default browsers on the iPhone, Androids and BlackBerry handsets are secure directly out of the box. So leave those settings as they are if possible. These networks do not require any authentication or passwords whatsoever for access from anyone. So what happens is that hackers will set up their own open networks to draw in potential unsuspecting victims. 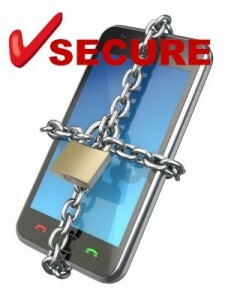 Use networks which are encrypted instead, the ones which require a password or an ID for access. These secure networks can be found in most hotels or businesses which offer WiFi network access. They should also have one of the following types of security: a WPA Wi-Fi protected access or a WEP wired equivalent privacy. Make sure that you turn off your WiFi when you’re not using your smartphone or tablet PC. This will prevent you or your device from automatically or accidentally connecting to any of the public networks, while extending your mobile battery life as well. A paid Wi-Fi network also doesn’t mean that it’s secure. URL’s starting with ‘https:’ are always safer when you’re accessing sites where you’ll be storing or sharing confidential or personal information such as data at your bank’s site. Always look for the “s” in the https: at all times. What the “s” means is that you are connected to that particular site via its Secure Socket Layer or (SSL). This means that all of the data that’s transmitted is encrypted. Keep in mind however that it isn’t totally foolproof. When you’re on an un-encrypted network connection, you may potentially be a victim of a “man-in-the-middle” or (mITm) attack, which is a form of eavesdropping when someone can make an independent connection between two parties. So to guard yourself against this, make sure that you’re connected to a secured network as well as to a https: site when entering sensitive information. Also, the majority of email services providers will offer just text emails as well as an encrypted option or (SSl). Always have the SSl option enabled. A VPN will provide secure access to a company’s network as well as allowing you to surf online protected behind an additional secured layer. So if at all possible and if available, use a Virtual Private Network. If the setting on your mobile device automatically enters your user name and password, or your login information into the Websites, then turn that auto feature off. Choose which apps you download wisely, particularly if you have an Android device as the Android market does not have the strict developer standards as the Apple’s App Store does. For the majority of times, you can repair any attack be just usually changing your password to something a lot harder to crack. Also ensure that each of your mobile devices has an auto wipe feature or remotewipe, just in case it happens to be stolen.